Falcons have beaten Utah State each of the past three seasons. (Eli Lucero/Herald Journal via AP) Utah State safety Jontrell Rocquemore (3) and defensive end Devon Anderson tackle Tennessee Tech running back Andrew Goldsmith (23) during an NCAA football game, Thursday, Sept. 13, 2018, in Logan, Utah. Everyone knows Air Force is a run-oriented team, but stopping the Falcons' offense is not that simple. Good thing the Aggies had two extra days to prepare for a division rival that has given them more trouble than any other — including Boise State — the past three seasons. USU already enjoyed one victory over a team that bothered them all winter, routing New Mexico State 60-13 to avenge an overtime loss in the Arizona Bowl. And now they’ll meet another team that kept them from clinching a winning record in 2017, after Air Force rallied for a 38-35 win last November. The Falcons will visit Maverik Stadium in Logan in a Mountain West opener for each team Saturday night. The Falcons had a bye last week; USU’s schedule was only slightly different. 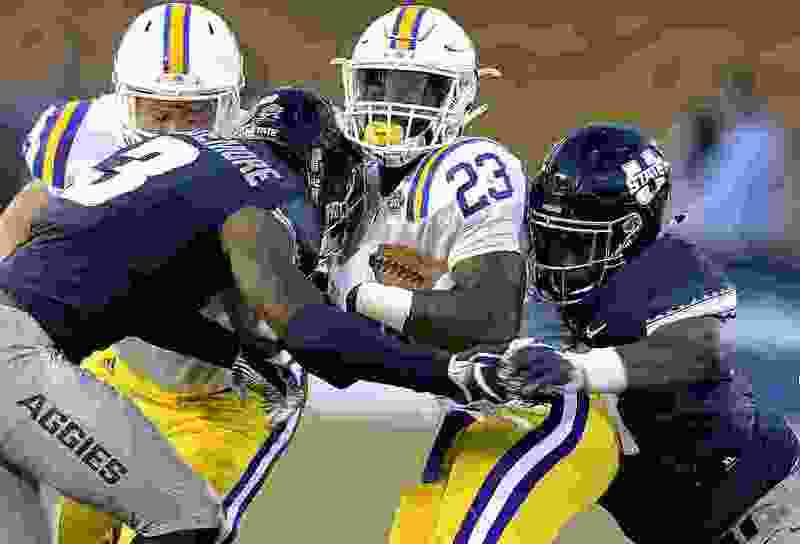 The Aggies beat FCS member Tennessee Tech 73-12 on Sept. 13, giving them extra rest and practice. USU started preparing for the Falcons last weekend, with new defensive coordinator Keith Patterson going against Air Force for the first time. The Aggies will be motivated for AFA’s arrival, after believing they should have beaten the Falcons in their past three showdowns. In the 2017 regular-season finale, USU took a 35-31 lead, only to have AFA drive 75 yards for a go-ahead touchdown. The Aggies then reached the AFA 42-yard line, but were stopped on fourth down. Records: AFA 1-1 (0-0 MW); USU 2-1 (0-0 MW). Series history: AFA leads, 4-2. Last meeting: AFA 38, USU 35 (2017). About the Falcons: They were off last weekend, after opening the season with a 38-0 defeat of Stony Brook and a 33-27 loss at Florida Atlantic. … The Falcons went 5-7 last year, missing a bowl game but concluding their season with a third straight win over USU. … QB Isaiah Sanders has passed for 164 yards in two games; FB Cole Fagan has rushed for 147 yards. About the Aggies: USU is concluding a three-game homestand. … The Aggies have scored 31, 60 and 73 points and rank fourth in the FBS with a 54.7 scoring average. … USU’s defense has intercepted five passes and recovered four fumbles. … The Aggies are off next week before visiting BYU on Oct. 5.